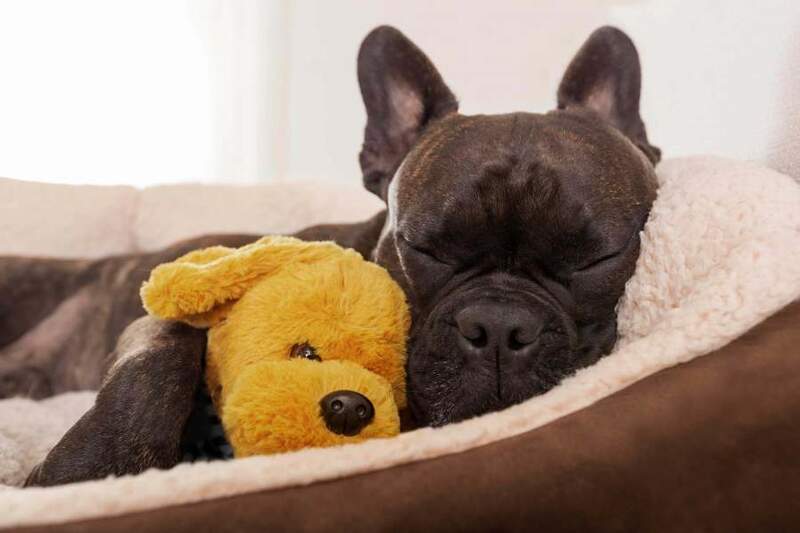 From luxury dog beds to those that offer Orthopedic qualities, heated options and designer threads, it’s time to take an in-depth look into the impressive range of dog beds available to your pampered pooch. With so many dog beds on the market it’s easy to get lost in the midst of foam and fluff to find the perfect bed for your dogs particular needs. So what should you look for in a good quality bed for different age groups when it comes to dogs? Very young dogs will want comfort in terms of feeling snuggly and warm. Security is a big deal with pups, particularly after coming home from a litter full of warm snoring siblings. For pups it is always best to look for a small dog bed (even if they are set to grow into a large dog), and preferably one with sides so they can cuddle up with the feeling something is snuggling up behind them. It is best to go for the cheaper variety. Chances are your pup will either grow out of this ‘beginner’ dog bed or chew it. Remember that puppies will chew their bedding so ensure you have plenty of chew toys and correct your pup as needed. Once your dog grows consider larger and more permanent dog bed. Trampoline dog beds (the ones that sits off the floor). It’s important that these beds are the correct size for your dog. So make sure you get the right advice. These are also great for outdoor use as many are weather proof. Foam dog beds – These come in all different sizes and supportive qualities. Luxury dog beds – can even be handmade with all the bells and whistles and are absolutely stunning. Designer dog beds – you can have your very own dog bed made to suit your décor. Just check you are also getting a good bed and not just an atheistically pleasing piece of furniture. Giant pillow dog beds – these can be a little more supportive than your average fluffy-type beds and come in a range of sizes and colours to suit any home. Cushion beds – these can come in huge sizes and are very cozy and warm. Just be sure your dog likes to sleep on a giant cushion or it may become an ornament and not a bed. Waterproof dog beds – great for outside use. Particularly for the larger dog breeds, remember to ensure your dog is done growing before spending a lump-sum on a new bed. This bed should last you a long time so investing in a solid and decent dog bed is a good idea. Also ask yourself what your dog requires, this may affect the final outcome and look of the dog bed. Larger dogs will need good support, and smaller dogs should not be expected to jump-up and down to large, high beds. Sometimes you’ll spend hundreds on a new dog bed and find your dog prefers the floor. If this is occurring in your home, consider a firmer bed or mattress instead of the pillow variety. For our older dogs it’s important to consider their bedding. Some will need specially designed dog beds. There are some great orthopedic dog beds on the market and they can really help ease the sore joints of an arthritic dog and help heal those dogs recovering from operations and injury. Even though you may be tempted to indulge in a big fluffy pillow bed, it’s best your older dog sleeps on a foam mattress that is low to the ground, and very supportive. Your dog should be able to get in and out of the bed easily. Trampoline dog beds with a small blanket can also be beneficial. But if your dog is suffering or being treated for arthritis, stick with a supportive foam bed or orthopedic bed. These can really make a huge difference in the life of an older dog. During the winter even consider the heated dog beds that are available. Just ensure you turn the dog bed off when not in use. These can help ease cold and stiff joints. More information on looking after your older pet found here. Nadia Crighton is a well-known and accomplished Australian Journalist and pet magazine Editor. As a busy mum of four humans, two dogs, 50 sheep, three cats, three axolotl’s, a handful of chickens and a goat named Billy, she simply adores pets of all shapes and sizes. These are her personal thoughts and advice from many years of pet-ownership.